Researchers have searched for factors that predict the metastatic potential of melanomas for decades. In recent years, the study of their metastatic potential has progressed from routine histological analysis of Hematoxylin-Eosin stained slides to proteomic, genetic, and molecular pathological analyses. As a result, knowledge about the metastatic potential of melanomas has progressed. Hundreds of prognostic factors have been described in literature and it is not possible to mention all of them in a report. Therefore, in the current report, we summarize some of them. The way for explanation postischemic dementia processes has been one fraught with a wide range of complications and frequent revisions with a lack of a final clear solution. Data from animal models of brain ischemia and human ischemic brains studies have demonstrated an overexpression of amyloid precursor protein and increase production of a beta-amyloid peptide. Restoration brain activity following ischemic brain episode is delayed and not always complete due to an alteration related with increase in the level of the beta-amyloid peptide. In this paper, we will propose our idea about production of the beta-amyloid peptide from the amyloid precursor protein in ischemic brain lesions, and how this protein presents etiological and therapeutic targets that are now under consideration. Maturation of the ischemic brain tissue pathology may be caused not only by a neurodegeneration of selectively vulnerable neuronal cells destroyed following ischemia but also by acute and chronic pathology of resistant parts of the brain and chronic changes in the blood-brain barrier. We propose that in dementia following ischemia an initial ischemic episode precedes the brain tissue deposition of beta-amyloid peptide, which in turn amplifies the vascular dysfunction after first episode of ischemia triggering next focal ischemic episodes as vicious cycle preceding final ischemic degenerative changes and may gradually over a lifetime, progress to brain atrophy and finally to postischemic dementia with Alzheimer's phenotype. Current techniques in tissue engineering may offer a choice regarding the reconstructive strategies of peripheral nerves. Schwann cell cultures are to be considered an appropriate option in the reconstruction of peripheral nerve and spinal cord large defects. Schwann cells availability from peripheral nerve autografts creates a great benefit concerning their usefulness in the nervous autogenic transplantation. Allogeneic Schwann cells transplantation can be effective in the reconstruction without delay of peripheral nerve defects. Aging is associated with changes in arterial wall structure and function that exceed physiological adaptation, with an increased risk of cardiovascular events. The most consistent structural changes are luminal enlargement (dilatation), wall thickening (remodeling), and a reduction of elastic properties. Endothelial dysfunction plays an important role in the functional changes that occur with age. New target therapies to prevent or reverse this process are under evaluation. Ovarian cancer-related angiogenesis is a complex process orchestrated by many positive and negative regulators. Many growth factors are involved in the development of the tumor-associated vasculature, and from these, endocrine gland-derived vascular endothelial growth factor (EG-VEGF) seems to play a crucial role. EG-VEGF is the first organ-specific angiogenic factor and its effects are restricted to the endothelial cells of the endocrine glands. Although EG-VEGF was detected in both normal and neoplastic ovaries, its clinical significance remains controversial. In the present study, we analyzed 30 patients with epithelial ovarian cancer, and the immunohistochemical expression of EG-VEGF was compared with the conventional clinico-pathological parameters of prognosis. Neoplastic cells of the ovarian carcinoma expressed EG-VEGF in 73.33% of the cases, as a cytoplasmic granular product of reaction. We found a strong correlation between the expression of EG-VEGF at protein level and tumor stage, grade, and microscopic type. The expression of EG-VEGF was found in patients with stage III and IV, but not in stage II. The majority of serous adenocarcinoma, half of the cases with clear cell carcinoma and two cases with endometrioid carcinoma showed definite expression in tumor cells. No positive reaction was found in the cases with mucinous carcinoma. Our results showed that EG-VEGF expression is an indicator not only of the advanced stage, but also of ovarian cancer progression. Based on these data, we concluded that EG-VEGF expression in tumor cells of the epithelial ovarian cancer is a good marker of unfavorable prognosis and could be an attractive therapeutic target in patients with advanced-stage tumors, refractory conventional chemotherapy. Although hardly ever used in current practice, fibrobronchoscopy may provide interesting histopathological-clinical correlations in patients diagnosed with different stages of evolutive asthma. The aim of the study was to evaluate the correlation between semi-quantitative microvascularization features and the asthma severity assessed according to the GINA classification 2006. Our study group consisted in 21 patients diagnosed with asthma of different stages of severity and two-control patients investigated by fibrobronchoscopy with associated biopsy. The tissue fragments underwent standard processing procedures for the immunohistochemical exam, using CD34 as microvascularization marker. The semi-quantitative analysis was based on the "hot spot" method and on a score system that corresponds to the microvessels density. The statistical analysis of the correspondence between CD34 score and clinical parameters was performed using the SPSS 17 software, applying non-parametric correlation tests. The CD34 evaluation showed an increase in blood vessels count in all asthmatic patients in comparison to the control group and a close correlation with the asthma severity, reflected by the FEV1 values. The statistical analysis showed an inverse correlation between FEV1 [%] values and CD34 expression (r=-0.93, p<<0.01). Our data concur to other research reports, supporting the hypothesis that angiogenesis initially facilitates the edema development and later on appears to be involved in the bronchial wall thickening, as a component of the chronic inflammatory response, with concomitant distensibility reduction. The bronchial mucosa microvascularization evaluation opens new perspectives for advanced therapies, with beneficial effects for asthmatic patients' life quality. Objective: The aim of this study was to investigate histological changes that occur in the periodontium of subjects with type 2 diabetes mellitus without signs of periodontal disease and to establish the influence of this systemic condition upon periodontal structures. Materials and Methods: Gingival tissue samples were obtained from 12 adult patients with type 2 diabetes mellitus and 10 healthy adults, as control group. The specimens were examined using standard dyes as Hematoxylin and Eosin and PAS-Alcian stain, by a microscope with different magnifications. Results: Our results showed that periodontal disease in patients with type 2 diabetes mellitus is characterized by significant inflammation, affecting both epithelial and connective tissues, with degeneration of dermal papilla, increase in number of inflammatory cells, destruction of reticular fibers and accumulation of dense collagen fibers (fibrosis). Conclusions: Within the limits of this study, diabetic subjects presented distortion in periodontal attachment, with changes in both epithelial and connective tissues, when compared to the healthy controls, suggesting that diabetes mellitus has an independent effect on periodontal tissue. This effect is observed in both groups, so that we considered it to be independent of the periodontal condition. Introduction: Adverse effects appearing during combined peg-Interferon and Ribavirin antiviral treatment against chronic infection with the_x000D_ hepatitis C virus are a major cause for treatment failures and abrupt interruption. In the prospect of the imminent introduction of new direct_x000D_ acting antiviral agents, with demonstrated higher rates of adverse effects, our study aimed to assess the severity and incidence of several_x000D_ types of adverse effects in a cohort of genotype 1 infected Romanian patients. Materials and Methods: We prospectively included a total of_x000D_ 150 patients (45 men), aged 25 to 64 years, who received combined peg-Interferon and Ribavirin antiviral treatment for chronic hepatitis C._x000D_ Out of these, 145 patients also had liver biopsies prior to treatment initiation. We recorded their viral loads, hemoglobin values and_x000D_ thrombocyte counts, as well as any dermatological, psychiatric or constitutional adverse effect after twelve doses, eight and twelve months_x000D_ of treatment, with two follow-up examinations at three and six months after treatment completion. Results: Viral loads significantly_x000D_ decreased after 12 doses of treatment, in the end a total of six patients (two men and four women) being declared non-responders._x000D_ Hemoglobin values and thrombocyte counts significantly decreased during treatment (p<0.0001), with their values being restored to pretreatment_x000D_ levels during the follow-up period. We did not find significant differences between the 12-doses, 8 and 12 months values during_x000D_ treatment (p>0.05). We recorded 43 cases (11 men and 32 women) presenting with rashes, drug eruptions and erythema. We only_x000D_ encountered grade 1 and 2 dermatological adverse effects. Psychiatric effects were present in 34 cases (10 men and 24 women, 22.6% of_x000D_ the group) and manifested as mild depressions, which did not require specific medication or antiviral dose adjustment. Patients also_x000D_ presented headaches (80.6%), fatigue (71.3%), nausea (47.3%), arthralgias (35.3%) and fever (30%). Conclusions: We did not encounter_x000D_ severe hematological adverse effects that would require Ribavirin dosage adjustments. Cutaneous and psychiatric adverse effects were_x000D_ also present in a significant number of patients; however, their severity did not influence the continuity or outcome of the antiviral_x000D_ treatment. Other constitutional effects were also present with no direct consequence on the course of treatment. Future agents employed_x000D_ in antiviral therapy shall require extensive monitoring of all adverse effects already acknowledged during dual combination therapy. Chronic Obstructive Pulmonary Disease (COPD) is one of the leading causes of morbidity and mortality in the industrialized and in the developing countries. Chronic bronchitis (CB) is one the three COPD clinico-pathological entities that in 2009 were estimated to be diagnosed in 9.9 million Americans. It is characterized by inflammation of the "bronchial tree" that results in tissue swelling and excessive secretions of mucus into the bronchi, with progressive airflow limitation. Our study aims to reveal the main morphological aspects of CB in our casuistry and to evaluate their correlation with major clinico-epidemiological parameters. Thus, we performed a retrospective clinical and morphological study on a group of 17 smoker patients with symptoms of chronic bronchitis, eight non-smokers diagnosed with chronic bronchitis and five non-smokers and asymptomatic subjects. We observed that CB developed especially in men of 65-year-old or older, especially in smokers with a median FEV1% at around 71. Histopathologically, patients with symptoms of CB, regardless of smoking status, presented on bronchial biopsies with focal squamous metaplastic change, goblet cell hyperplasia and enlargement of the bronchial gland mass because of the inflammatory process, consisting predominantly of mononuclear cells in the bronchial wall. The statistical testing proved a significant correlation between the densities of different inflammatory cell classes (with the exception of mast cells in the bronchial epithelium) and FEV1% values on epithelium and submucosa regions in all investigated groups. Introduction: The key of the successful renal transplantation is the ability to identify the best immunological match between donor and recipient considering the possibility of rejection phenomenon. The aim was to identify class I and/or class II cytotoxic antibodies in renal-transplanted patients in order to assess the immunological potential for prevention of subclinical or acute rejection episodes. Patients and Methods: We have evaluated ninety-two patients who had kidney transplantation in 2010 in Fundeni Clinical Institute, Bucharest, Romania, concerning HLA matching and anti-HLA immunization status. For HLA genotyping were used molecular biology methods - PCR-SSP (Invitrogen, USA). For cytotoxic antibodies, the methods used were ELISA (GTI Diagnostics, USA) and Luminex (One Lambda, USA). Crossmatch tests between donor cells and recipient serum were performed by ELISA (GTI Diagnostics, USA). Rejection diagnosis was supported by renal biopsy. Results: In the 20 presensitized cases, the rate of acute rejection was 30% while in the 72 unsensitized cases the rejection was 19.4%. The incidence of acute rejection was higher in anti-HLA class I presensitized patients compared with anti-HLA class II (20% and 14.3%, respectively) but there was no significant difference compared to pre-transplant unsensitized patients (19.4%). Sequential post-transplantation monitoring of anti-HLA antibodies has shown in pre-transplant sensitized patients group a constantly increasing of PRA value, while in the pre-transplant unsensitized patients group, 32% developed de novo cytotoxic antibodies. Conclusions: More sensitive and specific methods to detect anti-HLA antibodies before transplantation and sequential post-transplantation monitoring of these antibodies would be useful to identify patients who are at higher risk for allograft failure. Bladder cancer ranks among eight human malignant lesions, 90% being urothelial carcinomas. We evaluated the Ki67 and Bcl-2 immunoexpression and their correlations with clinicopathological parameters. The study included 45 primitive bladder urothelial carcinoma diagnosed in patients aged in VI and VII decades of life, predominantly in males. Histopathologically, the most numerous were moderately differentiated carcinomas (68.8%), most patients being classified in stage I of disease (48.8%). The analysis for Ki67 immunostain revealed positivity in 71.1% of cases, with higher values in moderate and poorly differentiated tumors in stage III or IV of disease. In contrast, immunoreactivity for Bcl-2 was present in 33.3% of well and moderately differentiated analyzed tumors and classified in stage I and II of disease. Tumor stage and grade is not correlated with Bcl-2 but there was a strong correlation with Ki67 proliferation index. Ki67 immunoexpression may be helpful to identify patients at high risk who may benefit by adjuvant therapies. Prader-Willi syndrome is a complex genetic disorder with narrow spectrum of facial phenotypic signs, which make the clinical diagnosis difficult in some cases. There are several reports describing the craniofacial appearance of Prader-Willi patients, but there are only a few cephalometric studies for these patients. In this study were included 18 patients with Prader-Willi syndrome and a control group of 18 subjects of both sexes selected based on specific criteria. The cephalometric radiographs of the patients were taken using the standardized technique with centric teeth in occlusion and lips in relaxed position. Angular, horizontal and linear measurements were analyzed for the study group and for the control group. We established that in Prader-Willi patients, there is a decrease of the majority of parameters but the degree of this reduction varies widely between patients and clinically typical facies not always have smaller measurements which can be found in an unusual facies. Facial dysmorphism in Prader-Willi patients varies a group ranging from miss proportions that do not alter the facial architecture as regard of facial typology, skeletal class and pattern of development to a severe disturbance of those. There is a degree of clinical heterogeneity between subjects with Prader-Willi syndrome on clinical evaluation and cephalometric study confirms the heterogeneity for this patients. Because the identification of smaller dimensions for majority of parameters in children and adults, the possibility of developmental delay or growth retardation delay can be excluded. These findings are important for the orthodontist for optimum timing of orthodontic management of patients with Prader-Willi syndrome. Invasive lobular carcinoma (ILC) is the second most common type of invasive breast cancer, having distinct prognostic and biologic implications. As an objective of the present work, we analyzed the clinicopathologic characteristics and prognostic factor of this invasive breast cancer variant. Clinical and morphological data of 25 cases of ILC collected during 2006-2011 were reviewed. Histopathologically, 11 cases were of classic type, and the others were non-classic with solid and histiocytoid subtypes being mostly encountered. Overall the non-classic ILC type was diagnosed in more aged patients (with a median age at onset of 59 years), with a predominance for a more advanced tumor degree differentiation (78.5% as grade 2 and 3), in advanced pTNM stages (50% in stage III and IV), with 50% lymph node involvement and with over 70% ER and Her2 reactivity. Statistically, we found that for the solid variant prevailed a PR+ and Her2- status while in histiocytoid subtype the PR- and Her2+ immunoprofile was most encountered. We conclude that non-classic ILC type represents a distinct entity of invasive breast carcinoma with a worsen prognostic than the conventional ILC type. This study aim was to identify the relations between tumor suppressor genes (p53, bcl-2, PTEN), nuclear proliferative antigen Ki-67 and epidemiologic, morphologic and histologic patient related factors, in colorectal cancer. Materials and Methods: Twenty-two prospectively collected colorectal cancer resection specimens were histologically prepared, using standard paraffin-embedded and Hematoxylin-Eosin staining method; for immunohistochemical study, the Streptavidin-Biotin (sABC)/Horseradish Peroxidase (HRP) method was used. Results: P53 was positive in 86.36% of cases, more intense (>50%) in rectal cancer and in women 59.16+/-9.49-year-old; the G1/2 adenocarcinoma was dominant. Bcl-2 was positive in 18.18% of the cases, in distal colorectal cancer, only in men, 63.5+/-13.2-year-old. PTEN was positive in 95.45% of the cases; intense positivity was recorded in 12 men and six women, 61.47+/-11.67-year-old, in rectal topography. Ki-67 was positive in 86.36% of the cases, more intense in four men and four women, 63.45+/-12.22-year-old, in proximal and advanced colorectal cancers (pT3N1/2 - 62.5%). Conclusions: Tumor suppressor genes mutations are often present in colorectal cancer; the intensity of the expression of these mutations varies, which could explain the different prognosis for these patients. The avascular necrosis of the femoral head is an illness induced by the cutoff of blood flow to the femoral head and it affects mostly young adults between the ages of 30 and 50 years, raising therapeutic and diagnostic issues. Many risk factors are incriminated in the development of avascular necrosis of the femoral head like: trauma, chronic alcohol consumption, smoking, administration of corticosteroid drugs, most of the cases are considered to be idiopathic. The main goal of our paper is to describe the macroscopic and microscopic variations of the bone structure, which occur in patients with avascular necrosis of the femoral head. Materials and Methods: The biological material needed for our study was obtained following hip arthroplasty surgery in 26 patients between the ages of 29 and 59 years, which previously were diagnosed with avascular necrosis of the femoral head and admitted in the Orthopedics Department of the Emergency County Hospital of Craiova (Romania) between 2010 and 2011. From a macroscopic point of view, we found well defined areas of necrosis, most of which were neatly demarcated of the adjacent viable tissue by hyperemic areas, loss of shape and contour of the femoral head and transformations of the articular cartilage above the area of necrosis. When examined under the microscope, we found vast areas of fibrosis, narrow bone trabeculae, obstructed blood vessels or blood vessels with clots inside, hypertrophic fat cells, bone sequestration but also small cells and pyknotic nuclei. The microscopic and macroscopic findings on the femoral head sections varied with the patients and the stage of the disease. In this study, we analyzed EGFR, HER2/neu and Ki67 immunoexpression for 26 benign, borderline and malignant serous ovarian tumors. EGFR and HER2/neu immunoreactions were present in some benign/borderline tumors with high/low intensity of immunostain. In poorly differentiated adenocarcinomas, the EGFR/HER2/neu reaction was intense compared to well-differentiated ones. The Ki67 medium proliferation index was 2.1% for benign tumors, 6% in the borderline and 47.7% in malignant tumors. EGFR, HER2/neu and Ki67 can be used to identify benign/borderline tumors with progression potential and the malignant aggressive tumors. The values of the glucose influence the status of the periodontium, but also the periodontitis influences the glucose balance by increasing the resistance to insulin. In the case of children in the first step the gingivitis appears, than if the glucose control is not made and the dental hygiene is defective the evolution is towards advanced periodontal disease. The present histomorphometric study wants to emphasize the eventual changes that appear at the level of the gingival epithelium before and after starting a correct treatment of the periodontal disease. The histomorphometric study indicates an average nuclear area of the keratinocytes of 211.65 micro-m(2) in the batch studied before the application of the treatment and an increase of the average nuclear area to 234.88 micro-m(2) after the treatment (p=0.010538). The nuclear volume before the treatment has an average value of 2396.61 micro-m(3), after the treatment it reaches the value of 2996.924 micro-m(3). The area of the keratinocytes has an average of 495.43 micro-m(2), after the treatment it reaches the value of 724.89 micro-m(2), noticing a 14.6% (p=0.004) increase of the cellular area. Before the treatment, we notice a ballooning of the cells from the intermediary level, the existence of some pyknotic nuclei and the disappearance of the nucleoli. The associated gingival pathology diabetes mellitus type 1 in the case of children and teenagers is treatable within six months, macroscopically and microscopically the gingival mucosa approaching to normal conditions. In the case of children and teenagers diagnosed with type 1 diabetes, the dental check is mandatory in order to prevent the gingival and periodontal diseases. Meckel's diverticulum, being considered as the most frequent malformation of the digestive tract, has been largely presented in scientific papers, but a complete physiopathological mechanism for its natural history has not been yet described. We have studied the nervous system and the differences observed in eight Meckel's diverticulums with enteric or ectopic gastric mucosa, using specific immunohistochemical markers. It has been noted a significantly higher density of myenteric nerve fibers in areas with enteric mucosa compared with the areas with gastric heterotopias, while the transition zone had intermediate nerve fibers density. The ileal wall near the diverticulum had a myenteric plexus density similar to gastric mucosa intradiverticular area. The density of Meckel's diverticulum myenteric plexuses determines the local peristalsis. The enteric type mucosa diverticulums has more intense peristaltic activity which leads more frequent to intussusception or, in case of intraluminal obstruction, might be also involved in germ spreading and progression of infectious process. The lower density of Auerbach's plexus nerve fibers in cases with gastric heterotopia Meckel's diverticulum determines less effective drainage of diverticular content, favoring the contact of intradiverticular mucosa with acid secretion of gastric mucosa area. The gastric mucosa's defense mechanisms and the intense peristaltic activity in the zone with enteric mucosa offer a certain protection against the apparition of intradiverticular ulcerative lesions, which usually are observed on the ileum, near the diverticulum. The age related decreasing number of myenteric nerve fibers density explains the higher frequency of Meckel's diverticulum complications in children. With the remarkable progress in the field of burns treatment, the outcome of extensive burns improved significantly. The increased likelihood of survival of a burn victim heightens concerns for potential psychological morbidity for the survivors. Hypertrophic scarring is devastating and can result in disfigurement that affects quality of life. To assess the impact of burn scars on the quality of life of the survivors, we used two scales: the WHOQOL-BREF questionnaire to evaluate the quality of life and the POSAS scale for the subjective evaluation of the post-burn scars in 26 patients who suffered extensive burns and received allotransplant. A significant correlation was observed between the WHOQOL-BREF score and POSAS scale (r=-0.93, p<0.001). In conclusion, burn scar visibility and severity did have a strong relationship with the quality of life in the survivors of a major burn who received allotransplant. Therefore, more effort must be placed into developing psychosocial interventions that help survivors to accept scars, reduce depression and build a strong supportive system. In this study, we analyzed the VEGF and CD105 immunoexpression in 24 cervical squamous cell carcinomas and CIN associated lesions with different degrees. For both lesions, MVD values were higher in patients who had associated risk factors. VEGF and MVD expression increased in both categories for high-grade lesions, respectively CIN III lesions compared with CIN I/II and poorly differentiated carcinomas compared with well-differentiated ones. Also, there was a statistically significant association between VEGF and MVD in poorly differentiated carcinoma and CIN III. The study indicated that analyzed markers were specific for both early and advanced stages of cervical angiogenesis. Maximum values of VEGF and MVD in CIN III designate this lesion as critical to the progression of neoplasia. The vagus trunks, anterior and posterior, and their respective branches control the parasympathetic innervation of the stomach. After giving off a few thin branches, at the lower part of the esophagus and the cardiac region of the stomach, the anterior vagal trunk divides into its main branches: four or five consecutive direct branches which supply the upper part of the lesser curvature; these nerves do not form plexuses and thus, they may be individually dissected. One of the branches is stronger than the others and is called the principal anterior nerve of the lesser curvature (anterior nerve of Latarjet). 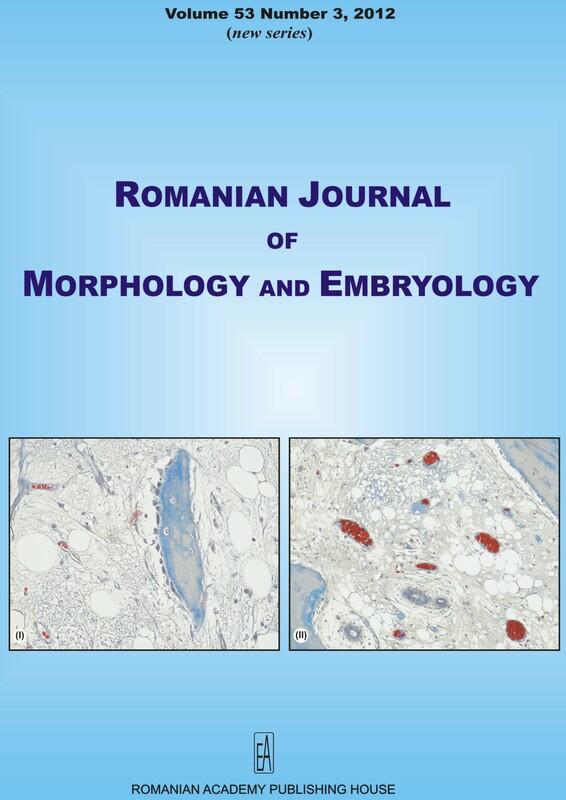 The present study was conducted on eight fetuses of different gestational age (resulting from spontaneous abortions, without malformations), observing the Romanian laws of professional ethics, and 15 adult cadavers (male and female) whose celiac region was dissected macro- and mesoscopically to reveal both the celiac ganglia and their afferent and efferent vessels. For the microscopic study, we used the Bielschowsky silver staining method. The meso- and macroscopic dissections revealed the anterior and posterior vagal trunks in all the specimens (100%), as well as a rich gastric periarterial plexus. The microscopic samples focused on the ontogeny of the celiac ganglion in various gestational stages. In this study, we have analyzed the EGFR and Her2/neu expression in oral squamous carcinoma and adjacent dysplastic areas. The lesions were diagnosed especially in the sixth decade of life, in male patients, localized on the lips, especially as well and poorly differentiated carcinomas (34%). The EGFR immunostain has been intense in over 50% of the tumors cells in well-differentiated carcinomas, expression diminished in the moderately and poorly differentiated carcinomas. Her2/neu marker recorded a score of 3+ in moderately and poorly differentiated carcinomas, the reaction turning out positive in 25% of the cases. Our study included a number of 24 cases with Warthin tumor, diagnosed between 2007-2011, which were analyzed in terms of clinical, histopathological and immunohistochemistry point of view, using CK7, CK5/6, CK19, and p63 antibodies. Warthin tumor is most often a tumor with a slow evolution, painless, usually affecting males (M/F 3.2/1) in the seventh decade of life. Histopathologically, it is distinguished the predominance of the typical forms of the tumor, with a balanced ratio epithelium/stroma. The immunostaining for CK7 showed positivity in all the investigated cases both in the columnar luminal cells and basal cells. The immunostaining for CK5/6 was positive in all the investigated cases in bilayer epithelial basal cells, both in the structure of the cysts and the papillae. In the case of the immunostaining for p63 we noticed limited nuclear positivity in the basal cells, while the columnar cells' nucleus were negative. The immunohistochemical study of the bilayer epithelial component of Warthin tumor showed different immunstaining of the two types of epithelia, the oncocytary columnar and the basal on, similar to those found in the salivary gland ducts. Introduction: The prevalence of nonalcoholic fatty liver disease (NAFLD) is increasing all over the world. NAFLD has been demonstrated to be associated with carotid artery atherosclerosis, evaluated using the intima-media thickness (IMT). In this article, we focused on the association between NAFLD, carotid parameters such as: intima-media thickness (IMT), pulsatility index (PI) and resistivity index (RI) as markers of subclinical atherosclerosis and the presence of retinal vascular disorders. Patients and Methods: We compared carotid IMT, pulsatility and resistivity index evaluated by ultrasonography, in 10 patients with histological-proven NAFLD and retinal vascular changes (retinophotographies). Results: The degree of hepatic steatosis, necroinflammation and fibrosis in NAFLD patients was strongly associated with the value of carotid IMT and also with PI and RI. Moreover, there seems to be a connection between the degree of NAFDL and the retinal vascular changes in patients with carotid atherosclerosis. Conclusions: These results suggest that the severity of liver histopathological lesions among NAFLD patients is strongly associated with carotid parameters: IMT, IP, IR and also with retinal vascular changes. Further controlled studies are needed to confirm the results. Endocervical adenocarcinomas account for about 10-30% of cancers of the uterine cervix and display a variety of disparate morphologies. As an objective of the present work, we analyzed the clinicopathologic characteristics and prognostic factor of cervical adenocarcinoma. Clinicomorphological data of 16 cases of endocervical adenocarcinoma were reviewed during 2006-2011. Histopathologically, seven cases were of mucinous endocervical type, one intestinal type, two mucinous villoglandular type, four endometrioid type and two of serous type. The immunohistochemical investigation showed a tipically endocervical carcinoma profile ER-/PR-/Vim-/CEA+ in 10 cases (62.5%), which morphologically corresponded to: five mucinous endocervical type, one villoglandular type, three endometrioid type and one serous type. Regarding the prognosis we established that endometrioid endocervical adenocarcinoma is the histological variant with the worst prognosis, most cases been diagnosed in advanced stages (IIIA and IIIB) while at the opposite pole were papillary villoglandular and serous endocervical adenocarcinomas, diagnosed in less advanced stages of disease (IB and IIB). We concluded that the clinicomorphological diagnosis of endocervical adenocarcinoma is a challenging task, given to its multitude of histological variants and to the fact that immunohistochemistry investigations proved to be useful in only 63% of cases. In addition, we confirmed that the clinical stage is the most important prognostic factor and to some extent, the histomorphologic features can condition the biological behavior of these tumors. Retroperitoneal sarcomas (RPS) are uncommon tumors associated with a poor prognosis. This is particularly true in case of high-grade sarcomas of specific histological subtypes, as demonstrated by the largest surveys of the last decade. Up to the present day, unfortunately there are no powerful tools available except for surgery. On the other hand, the resection rate of RPS is significantly increased over the last decades allowing to deliver the best treatment available. This paper reports on the case of a young patient who was incidentally diagnosed with a retroperitoneal mass. The patient underwent surgery in our department and the histological report showed a spindle cell sarcoma of high grade of malignancy with an incomplete muscular phenotype. The patient was discharged on the seventh postoperative day and he is still free of local and distant recurrence. It is currently considered that hump dense deposits developed during an acute poststreptococcal glomerulonephritis become finally dissolute by three hypothetical mechanisms: loosing their electron density, internalization and processing by podocytes and by incorporation in the glomerular basal lamina (GBM). Analyzing ultrastructurally the association of polymorphonuclear leukocytes and hump deposits, we emphasized features endorsing the hypothesis that the immune complexes of dense deposits are discharged in the circulation under the leukocytes activity. The active polymorphonuclear cells are melting the GBM in the area of contact by complement activation and by the NAPlr bound plasmin. The reversed flow of immune complexes from humps towards the blood circulation leaves fading, wrinkled shaped humps, before total dissolution. A combination of unusual bilateral drainage of the testicular veins observed in a male cadaver utilized for educational and research purposes is prescribed. In specific, the right testicular vein was terminated on the right renal vein at almost right angle, whereas the left testicular vein was bifurcated into a lateral component drained into the left renal vein and a medial component opened into the inferior vena cava close to its confluence with the left renal vein. Such a co-existence of bilateral testicular vein termination is very rarely presented in the literature. The main goal of this study is to provide an embryological development model for these variants and to highlight the likely occurrence of these anomalies to the surgeon of the region. The awareness of these venous anomalies can facilitate the surgeons in order to ligate properly and adequately the abnormal venous terminations and collaterals reducing that way the recurrence rate of varicocele. Type B1 thymoma is widely accepted as a tumor with a non-aggressive behavior even in advanced stage. Most of these tumors are classified as Masaoka stage I or II. They rarely relapse or metastasize and the surgical treatment is considered curative. We have investigated a case of thymoma type B1, which relapsed 13 months after the primary tumor was excised. The patient was diagnosed with a local tumor recurrence after investigations due to the worsening of clinical symptoms of myasthenia gravis (MG). The therapy management of such cases is debatable and protocols not yet approved. For this reason, we have analyzed different clinical, morphological and immunohistochemical characteristics that may be considered as prognostic factors for a more aggressive behavior of such tumors. We have identified some morphologic characteristics rarely seen in this type of thymoma but none considered of prognostic value. In addition, we investigated some possible immunohistochemical markers that are generally associated with a more aggressive clinical outcome in different malignant tumors and thymic epithelial tumors. Among these markers, only p53 was positive and may be useful to predict a more aggressive evolution. In summary, probably the more appropriate approach of the patient is the clinical follow-up together with treatment of the clinical symptoms of myasthenia gravis. "Refractory anemia with ring sideroblasts and thrombocytosis" (RARS-T) is a rare disease, a provisional entity, with a controversial status in the 2008 revised WHO classification. Even at present time, RARS-T is a matter of debate whether it is a distinct clinicopathological entity or more likely a constellation of clinical and pathological features of two well-defined myeloid neoplasms, myelodysplastic syndrome and myeloproliferative neoplasm. Perhaps none of the clonal disorders illustrates better the challenges presented by the current classification of myeloid neoplasms, than this clinical entity with overlapping features of both refractory anemia with ring sideroblasts and essential thrombocythemia. The purpose of this study is to present the evolution of such a case, with difficulties in establishing not only the correct diagnosis, but also the appropriate therapeutic approach. For this reported case, we present documented details regarding persistent thrombocytosis, slightly increased number of leukocytes and analysis of Janus kinase 2 (JAK2) genes that revealed a V617F mutation, confirming the presence of an underlying myeloproliferative neoplasm, followed later in the evolution by occurrence of myelodysplastic features as ring sideroblasts. This case might interest pathologists, but especially clinicians, for at least two reasons: the rarity of this disease and the lack of data on prognosis of these patients, probably because of relatively recent established diagnosis criteria and existence of few studies with small number of patients. The third interesting aspect for practitioners would be the absence of consensus on optimal clinical treatment for this disorder, because there are few cases that meet the rigorous diagnostic criteria. Objective: This paper aims to reveal the actual benefit of vestibular rehabilitation (VR) in patients with unilateral vestibular loss. Patient and Methods: Case report of a young female patient with acute unilateral vestibular loss due to facial nerve schwannoma developed above the internal auditory canal (IAC) from where it seems to have entered the IAC. Betahistine associated to VR treatment was recommended due to persisting imbalance after tumor removal. The benefit of the combined therapy was evaluated objectively (sensory organization test) and subjectively (questionnaires regarding self-perception of the deficit in quality of life). Results: Both evaluations revealed great improvement in stability (SOT scores) as well as in health-related quality of life (HRQoL) - improvement of self-perception scores of disequilibrium in all questionnaires used. Conclusions: Combined recommended treatment (betahistine and VR) improves HRQoL after acute unilateral vestibular loss. It reduces self-perceived disability and intensity of symptoms during usual activities. Congenital bilateral agenesis of the tibialis anterior muscles is a rare condition. We present a case of congenital absence of bilateral tibialis anterior muscles in a 6-year-old boy who presented with an abnormal gait. He was previously diagnosed to have bilateral congenital talipes equinovarus (CTEV) deformity for which he underwent corrective surgery two times. However, he still had a residual foot problem and claimed to have difficulty in walking. On examination, he walked with a high stepping gait and muscle power of both lower limbs was 5/5 on the medical research council scale (MRCS) except for both ankle dorsiflexors and long toe extensors. The sensation was intact. Magnetic Resonance Imaging (MRI) study of both legs revealed that tibialis anterior muscles were not visualized on both sides suggestive of agenesis of the tibialis anterior muscles. The rest of the muscles appeared mildly atrophied. The electrophysiological study showed normal motor and sensory conduction in both upper and lower limbs. Electromyographic (EMG) study of the vastus medialis was within normal limit and no response could be elicited for EMG of tibialis anterior muscles suggesting possible absence of tibialis anterior muscles, bilaterally. The patient underwent split tibialis posterior tendon transfer to achieve a balanced and functional foot and was well on discharge. The present case describes the normal anatomy and embryology of tibialis anterior muscles as well as possible causes of its agenesis along with its clinical implications.